Whether it's Facebook updates, tweets, blog posts, research reports, newsletters, video, white papers or more, we all produce content these days. How do you reach your audiences on each platform without completely exhausting yourself? Most likely your content and ideas are already there -- it's just a matter of crafting them for the desired channel and reach. For SlideShare, that largely means turning your content into visual stories. SlideShare can host many forms of content, including long form writing, videos, presentations and PFDs. But if you're going after number of views, there are a few things you could and should do to ignite the SideShare audience and attract more traffic. The first step is to think of SlideShare as a publishing platform rather than a posting repository. Many people upload existing articles or PDFs, using the site more as a container for already-created content. That may work for some cases, but if you really want to tap into the SlideShare audience, content should be optimized for those viewers. Think of it this way: You don't turn on your TV to listen to a podcast, right? Sure you could do it, but that's not using your TV to its fullest abilities -- nor do most people turn to their TVs for that purpose. You also likely share different content and updates on Facebook, Twitter and LinkedIn, based on their varying uses. The same goes for SlideShare. Content that is optimal for the site is visual, has a powerful cover page and is easy to read in the SlideShare player. And shaping your content to embrace this has rewards: SlideShare attracted an average of 60 million unique visitors a month in Q2 2013! This doesn't mean fitting a square peg into a round hole. Say you have a long-form article or white paper. You wouldn't want to drop each sentence on individual slides and string them together to recreate the piece -- what's the added value in that? Instead, think about how you can extract key points from the paper and visualize them on SlideShare. Or say you host a Tweet chat. Why not extend its shelf life and turn the best tweets into a visual slideshow? The possibilities are endless, but remember that great SlideShares most often are highly visual and have a certain flow to them, where readers quickly click through each slide. That usually means laying off dense text and either saving the additional material for the blog or e-book, or creating a series on SlideShare. SlideShare content doesn't mean it competes with your other content -- instead, think of how it can supplant it. If you extract key points or data from a longer report for SlideShare, by all means link back to that report for those who want to read more! (SlideShare PRO users can also surface lead generation forms to direct viewers to outside content.) On the flip side, share your SlideShares on Twitter, Facebook and LinkedIn for your fans who want more in-depth information than they can get on those platforms. SlideShare should be supporting your content strategy and giving you access to a whole new audience. 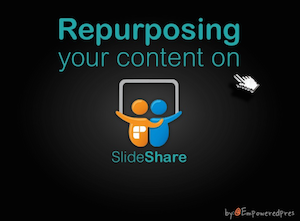 Get more detailed tips on how to repurposed content for SlideShare in this presentation by Empowered Presentations, and give it a whirl!